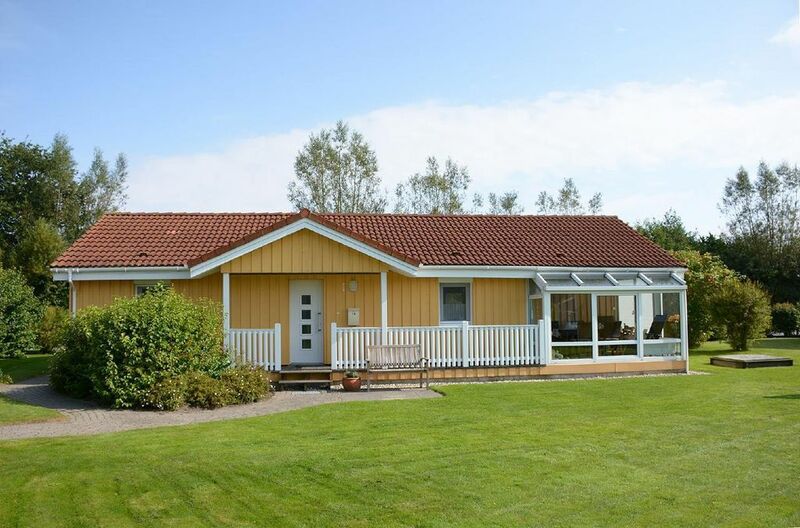 Ferienhaus Kathi is a comfortably furnished wooden house. In 2011, the thermal insulation has been improved in energy saving standard, all the windows were renewed and equipped with shutters and fly screen. The bathroom was completely renovated in 2017. In the living room satellite is held TV with Dolby surround system and DVD player. A DSL connection provides an easy internet access. The kitchen has a modern fitted kitchen with dishwasher, stove with 4 burners, oven, microwave, egg cooker, toaster and large fridge-freezer. A Tassimo coffee machine is also available alongside a standard coffee machine. The bathroom has a toilet, sink and shower. A machine is also available. One bedroom is equipped with a double bed 2x 90x200 cm. Here is also given the opportunity to set up the existing small cot. Another bedroom has a double bed 140x190 cm. The third Bedroom has a bunk bed for children. The brought bikes can be set in the storage room at the house. Sunbeds, garden furniture and barbecue. For the children there is a sandbox and sand toys ready. Final cleaning for pets: once per object costs of 25 EUR (mandatory). Towels: to rent once per person for 2. 5 EUR (optional). Final cleaning for occupancy of more than 4 people: once per person costs in the amount of 5 EUR (compulsory). Pet: once per animal Costs of 20 EUR (compulsory). Water: per object and day according to consumption (obligatory). Otterndorf, the green city by the sea, offers the neat city with many beautifully restored half-timbered houses. The Latin School and the Bauerndom are worth seeing. Museums for every taste offer insight into life in a merchant's house or an overview of modern art. Sport is very important. The Soletherme offers indoor and outdoor pools and a sauna and a spa area. In every season, completely different events are offered. Linen (once per person, available 8. 5 EUR). Towels (one per person, available 1. 5 EUR).